Saturday morning, three dozen athletes will walk the distance equivalent of San Diego City Hall to South Carlsbad State Beach. A few may finish under 4 hours; most will take 5 or 6. The best win major money. But no, it’s not the Farmers Insurance PGA Tour event at Torrey Pines Golf Course in La Jolla. About 20 miles east, Santee is hosting the USA Track & Field National 50-Kilometer Race Walk Championships with a purse of $60,500 — including $50,000 for the top American men and women ($8,000 for the winners). That doesn’t compete with the $7.1 million awarded at Torrey Pines, but admission is far cheaper in the East County town. It’s free. 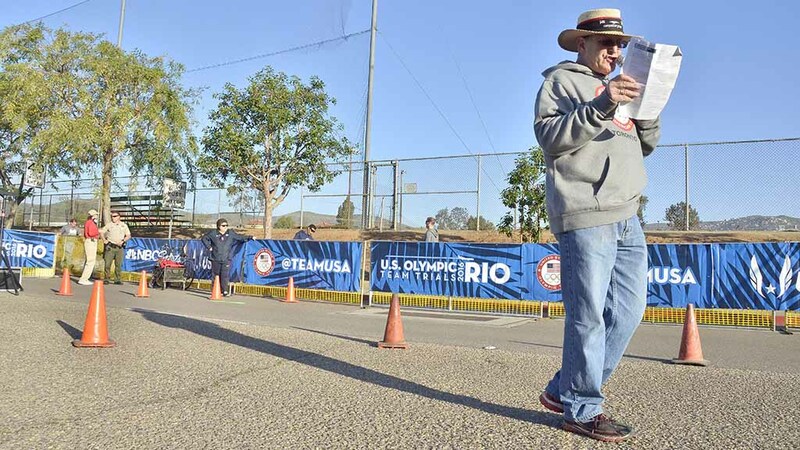 With the decline of elite funding at the Rock N Roll Marathon and Carlsbad 5000, this is “the richest prize purse of any road race or endurance event of any sort in the region,” says 50K walk director Tracy Sundlun of Santee. The 31.1-mile race — 40 laps of a 1.25K dogleg course adjacent to Santee Trolley Square shopping center — also decides who might compete Sept. 28 at the IAAF World Athletics Championships in Doha, Qatar. To be a part of Team USA (or any other national team), men have to beat 3 hours, 59 minutes. Women have to go under 4:30. Doha will be only the second time women have been allowed to contest the 50K distance in IAAF world events — thanks to rule changes championed by Erin Taylor-Talcott, one of Saturday’s entrants. Sundlun says Santee, which first hosted a 50K in 2009, played a significant role in letting women compete in the longer distance (in addition to the 20K). “Suffice to say, I believe [Santee] was critical in getting the [women’s] 50K into the world championships,” he said Thursday, crediting Taylor and her perseverance. For only the third time, the course will be on Town Center and Riverview parkways, south of San Diego Christian College and north of Mission Gorge Road. Previously, it was on Mast Boulevard south of Santana High School. The city asked for it. But the city manager insisted that organizers make sure the new course was at least as good as the old one, he said. So Olympians John Nunn and Tim Seaman and American record-holders Nick Christie and Katie Burnett reviewed the proposed course. Entrants range in age from 20-year-old Javier Mena Jara of Ecuador to 73-year-old Darlene Backlund of Palm Springs. They’ll start at 7:30 a.m.
“She will again be walking in memory and honor of her husband, coach and training partner John, who passed just before the 2017 championships where she honored him by setting a world [age-group] record,” organizers said of Backlund. At 40, Taylor-Talcott of Oswego, New York — labeled the “godmother of the women’s 50K” — may not be able to touch her personal best of 4:33:22. 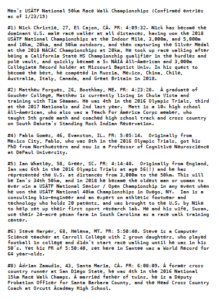 But she has a good shot at the world age-group record of 4:42:34 by Susan Randall — set at Santee in 2014. Randall, now 44, also will race Saturday. The resident of Beavercreek, Ohio, was born and raised in China, and runs her own catering business. Another immigrant with a chance of winning is 37-year-old Andreas Gustafsson of Las Vegas. A native of Sweden, he wasn’t chosen for that nation’s Olympic teams. In 2015, he was handed a two-year suspension after admitting he took the banned blood-booster EPO. Gustafsson, with a best of 3:50:51, became a U.S. citizen by marriage in 2015 but awaits IAAF approval to compete as an American. “They’re waiting, checking every day, for permission from the IAAF to represent the United States,” Sundlun says. At least 10 foreign entrants will compete for $10,500 in the Waterbridge Capital International 50km Challenge (with top male and female pocketing $2,000 each). Entrants hail from Mexico, Brazil, Costa Rica, Ecuador, Australia and Canada. Aussie Olympian Claire Tallent, 37, mother of a 20-month-old son with her four-time Olympic race-walk medalist husband, Jared, has a best of 4:09:33 and was ranked third in the world last year by Track & Field News. In fact, if she wins under the 4:30 IAAF standard, and the International Olympic Committee approves an IAAF recommendation to add the women’s 50K to the Olympic program, she would be the first woman worldwide to qualify for the Tokyo 2020 field. She’ll be pushed by two-time 20K Olympian Paola Perez, 29, of Ecuador, who with a 4:12:56 best was ranked fourth in the world in 2018. He and Burnett seek to defend their 2018 national 50K titles. 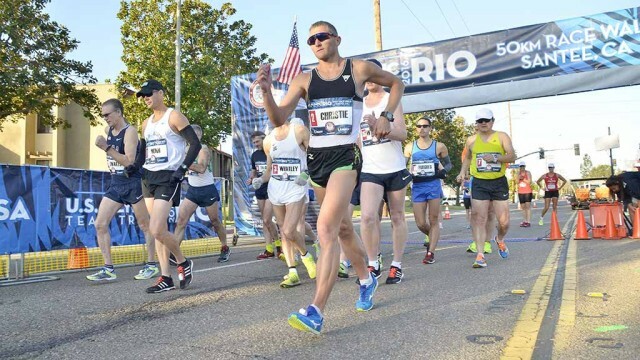 At least the top three finishers (male and female) will be named to the U.S. team for the 2019 Pan American Race Walking Cup April 20-21 in Lazaro Cardenas, Mexico, and the top two who walk 4:15 (men) and 4:55 (women) or better will compete in the July 26-Aug. 11 Pan American Games in Lima, Peru. Meanwhile, 54-year-old Allen James of Torrance and 46-year-old Dmitry Babenko of Burnaby, Canada, are shooting for world age-group records in an event also designated a national masters championships. Former Santee resident Carmen Jackinsky, a walking-shoe designer and seller now living near Portland, Oregon, hopes to finish under 5:45 — and smash the 55-59 American age-group record of 6:31:52. But the biggest winner may be Santee, which already has bragging rights for having hosted the 2012 and 2016 Olympic Trials. Organizers expect at least 1,000 spectators, who also will see local school and club cheerleaders perform and DJs play music along the three-quarters-mile loop course.